Visby is one of the most popular destinations in Sweden , experience the genuine old town center surrounded by the city wall with a myriad of restaurants and bars. Visby often tops the statistics for the most hours of sunshine per year in Sweden which also contributes to the popularity! Please see http://www.gotland.net for a list of everything you can visit and see! Flying to Visby is easier than most people think. Since Visby is a popular destination for us private pilots ATC is also very familiar with our type of traffic. So the approach, parking and handling at the airport is very smooth and fast. Determine your personal minimums before the flight and stick to them , the flight will be fun and a positive memory! TAF and NOTAMs can easily be found at AroWeb/MET/Low Level Forecast – LHP, area B SE ( southeast). The flight to Visby is a relaxing flight. You will have contact with Sweden Control on the way. As you approach Visby TMA request to leave Sweden and contact Visby Control to request clearance into Visby TMA. Also check the status of the restricted areas 31 and 28. Clearance required into Visby TMA. Check the airport hours via NOTAM, if they are active contact their frequencies in advance for clearance. There will not be any problems. NOTE: PPR may be required at certain hours, you cannot take off or land outside the airport hours without PPR. Are you out for taking a turn over Gotland and watch our beautiful island, the tower requests advance information about the flight via telephone 0046-498-21 23 49. If crossing of Restricted Area 28 / 31 request clearance. Since Visby is a controlled airport (open tower), your flight plan will automatically close when you land and is activated when you start the journey home. Around Visby, it can at times be a lot of traffic so be sure to keep a look outside (see and be seen!). 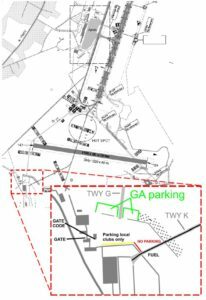 NOTE: two waiting areas at RWY 03, one located on TWY K and one on TWY M, listen carefully to the ATC to which one You are cleared to! Do not forget the life jackets! 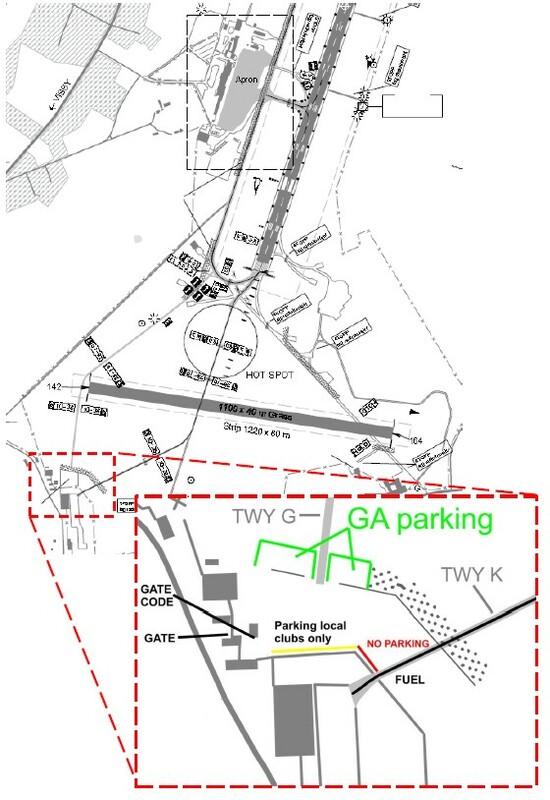 At the airport, you park on a grass parking located at the flying club. After you parked and left the aircraft, you can go out through a gate located at the red-white mast at the clubhouse opened by a button on the mast. On the way you pass a concrete building where the gate code is posted on the south side of the building. It’s recommended to refuel at arrival, especially if there are many aircraft on the grass parking lot. In July, it may be queued to the filling station when everyones going home. Payment of fuel is with a debet or credit card. OBSERVE: no automatic stop on tank nozzle, keep an eye on the tank level when filling! Taxis are one option. Taxi Gotland 0046-498-200 200, TaxiKurir 0046-498-500 00. It is about 2,5km to Visby, if you like to walk it takes about 30 minutes. At the flying club there is usually access to bicycles for rent. Flying club offers 6 double bedrooms and a dorm for 8. Contact Hans on telephone 0046-73-445 44 31, he will help you!